Belmont Resources Inc. [BEA-TSXV] on Wednesday March 14 said it has initiated the next stage of exploration and assessment on its Kibby Basin lithium property in Nevada. Belmont President and CEO James Place, along with the company’s consulting experts, are interpreting data and mapping from Quantec Geoscience’s Spartan Magnetotelluric (MT) Survey Report and have established approximate locations for drill holes. 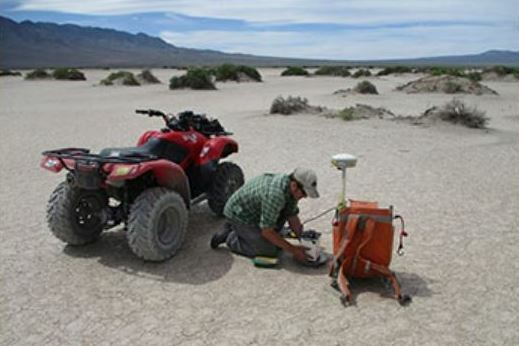 Conducting a gravity survey at Belmont’s Kibby Basin lithium project in Nevada. Source: Belmont Resources Inc. The survey covered most of Belmont’s Kibby Basin, Nevada claims and included the playa basin area as well as some of the adjoining higher level lands. Belmont’s consulting geologist Robert Cuffney from Reno, Nevada will finalize and map drill hole locations and process the applications for permits with authorities in Nevada in anticipation of drilling starting in the second quarter of 2018. On March 30, 2016, the company acquired 16 placer mining claims, representing 1,036 hectares in Esmeralda County, Nevada. The Kibby Basin property is located 65 km north of the Clayton Valley. On July 11, 2016, the company staked additional placer mining claims, totalling approximately 1,724 hectares adjoining the 16 Kibby claims, thus increasing the company’s total Kibby Basin land position to 2,760 hectares. On March 8, 2018, Belmont said it has raised $112,000 from an over-subscribed private placement financing. The private placement was comprised of 2.8 million units priced at $0.04 per unit. The company said it intends to use proceeds of the private placement for continued exploration on its 100%-owned Kibby Basin lithium property. Belmont shares were unchanged at 4.5 cents on Wednesday. The 52-week range is $0.09 and $0.02.